10 for $10 Ragu Pasta sauce; $3 off Breyers Gelato Indulgences;; 50% off Pepperidge Farm Texas Toast; 4 for $5 Pillsbury Grands! Buiscuits; $8.99 Publix Deli 20-piece Hot and Spicy Wings; 2 for $6 Lay’s Potato chips; $3.99 Brownies, 8-count; $11.99 lb Publix Green Wise New York Strip Steaks; $7.99 Snow Crab Clusters; $4.49 Publix Premium Chicken Cutlets; ; buy 1 get 1 free Mama Lucia Meatballs; $5.79 Publix Mild or Hot Italian Sausage; $4.99 Sirloin tip roast; 2 for 45 Oscar Mayer Lunchables; $2.99 lb Assorted Pork chops; $5.49 Lean Groun Beef; $2.49 lb Sweet Celebration Red Seedless Grapes; 10 for $10 Del Monte Fruit Naturals; 2 for $5 Broccoli or Artichokes; 2 for $5 Red Raspberries; $6.99 Publix Deli Chicken Tenders; $4.99 Assorted Italian Cookies; buy 1 get 1 free Small Fruit or Custard Pies; buy 1 get 1 free Post honey Bunches of Oats Cereal; ; $3.99 24 pk Deer Park Natural Spring Water; $2.29 Eggland’s Best Large Eggs; buy 1 get 1 free Suave Anyi-Perspirant Deodorant; 2 for $10 TResemme Shampoo or Conditioner; $5.49 Purex Laundry detergent; $7.49 Scott Bathroom Tissue. 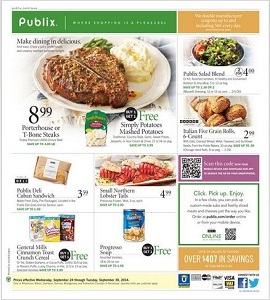 Publix stores activate their latest weekly ad every Wednesday.